You are making me uncomfortable, that hurts, leave me alone”. The potter simply smiled and said “not yet”. Then he put me on a wheel and begins to spin me around, and around. I got very dizzy but after a while I had taken on a new shape. He formed me into this tea cup. I thought he was finished but he put me into a furnace. It was so hot I did not think I could survive it. He came to check on me and looked through the window of the furnace, he had this look in his eye, it’s as though he was enjoying what he was doing to me. I screamed “let me out of here, it’s too hot” but he smiled and said “Not yet”. He finally took me out and put me on the shelf so I could cool off and I said “phew! Thank Goodness it is over, hallelujah”. I thought to myself now I could go back into been my normal self, then the potter came, picked me up and began another process. He began to paint me, changing me from my normal grey into this beautiful blue. The paint was sticky, it was uncomfortable, even smelly, and at one point I thought I was going to choke. Again I yelled "STOP"! But he said “not yet”. Then he put me into the second oven, twice as hot as the first one, this time I knew it was over. I screamed “let me out, please, please, I'm not kidding, I'm going to die”, Still he said “not yet”. After hours of hours, he finally opened the oven door, took me out and placed me on the shelve. Few weeks later, he came by and handed me a mirror and when I looked at myself. I could not believe how beautiful I had become; I could not believe how much I had changed. I did not look anything like that old lump of clay I used to be. 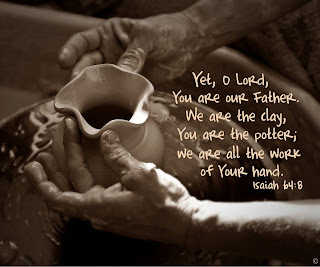 There was a time nobody wanted me, now I'm a beautiful tea cup, valuable, expensive, unique all because of this potter. He made me into something amazing. This is the way God works in our lives, constantly changing us from grass to grace and from glory to glory. The period of changing might be an headache; there might be a time of dizziness and discomfort and while we yell “PLEASE STOP”, God is going to smile and say "NOT YET, I am not done with you". Sometimes we see the clay but God sees a beautiful teacup, we are not a finished product, God is still working on us. Be patient, allow Him, work with Him. He is going to make you into that beautiful and valuable teacup. Never heard of the story before.what a captivating one.we work by the time yet we don't knw the time...can't just can't wait to look as beautiful as the tea cup...thumbs up graciouz5!! !